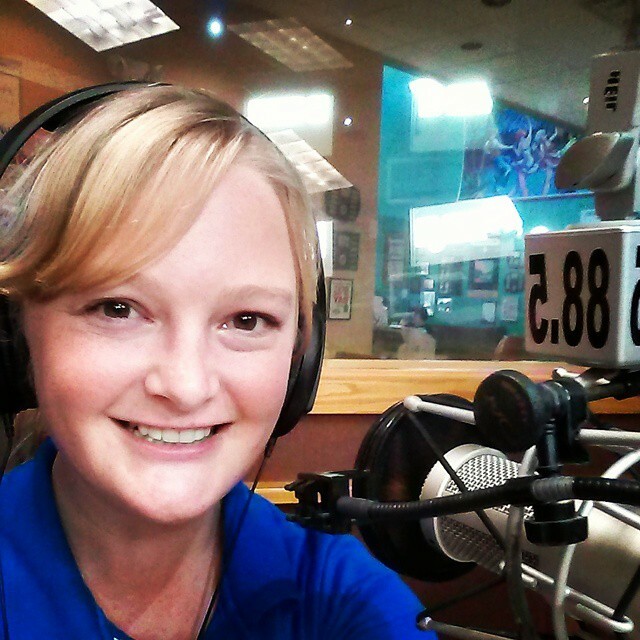 Water use and conservation are important subjects for youth nationwide. By demonstrating the actual average quantity of water use per person, youth can fully appreciate the scale of residential water use.The objective of this game is to effectively educate 50-120 fourth graders about water availability, where our water comes from, residential water use (consumption), and water conservation in less than 20 minutes. To begin, the extension agent or club leader discusses where we get our drinking water from and explains that water is a limited resource. It is essential to the game that the leader explains the concept of a water budget to the youth. 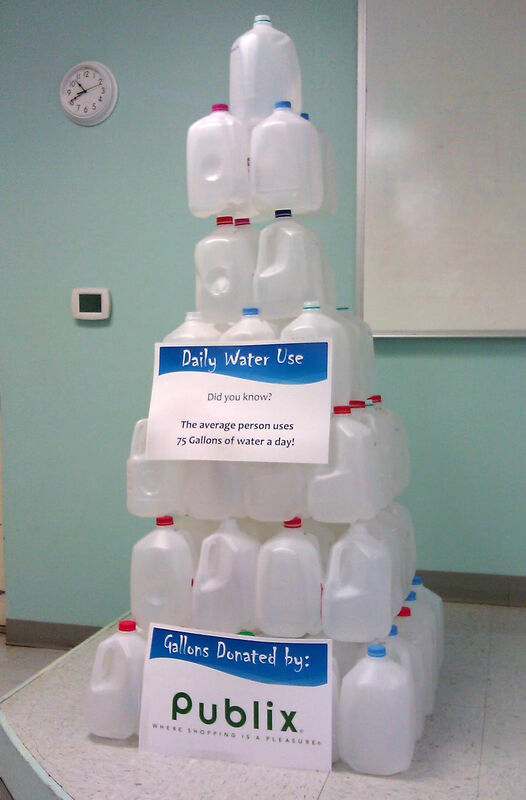 Pyramid of gallon jugs illustrating the average daily water use of a Florida resident. Youth are split into groups of 8-15 students depending on the total number in the group and if necessary, sent to stations with game materials. The stations will be competing, so the group should be split into at least two teams. At each station, students will need 50 clean, empty gallon jugs (the water budget) and a bucket filled with ‘water use’ and ‘water conservation’ cards. The concept for the game is to do as many “uses” as you can before busting your water budget. Youth will take turns pulling a card from the bucket, no peeking! Each card will either have a “water use” or an “conservation action” that youth and their families can take to conserve water at their home. Each card will indicate how many gallons were used or saved, and the youth should move those gallon jugs from the “budget” pile to a new, “used” pile. A teacher or volunteer helps the students work through the cards ‘using’ and ‘conserving’ water gallons (the jugs) from their water budget. As the students work through the game, they will eventually run out of jugs to move out of their budget pile. The teams will compare how many “water uses” they were able to do before busting their budget and learn about the conservation actions which allowed them to extend their water budget. 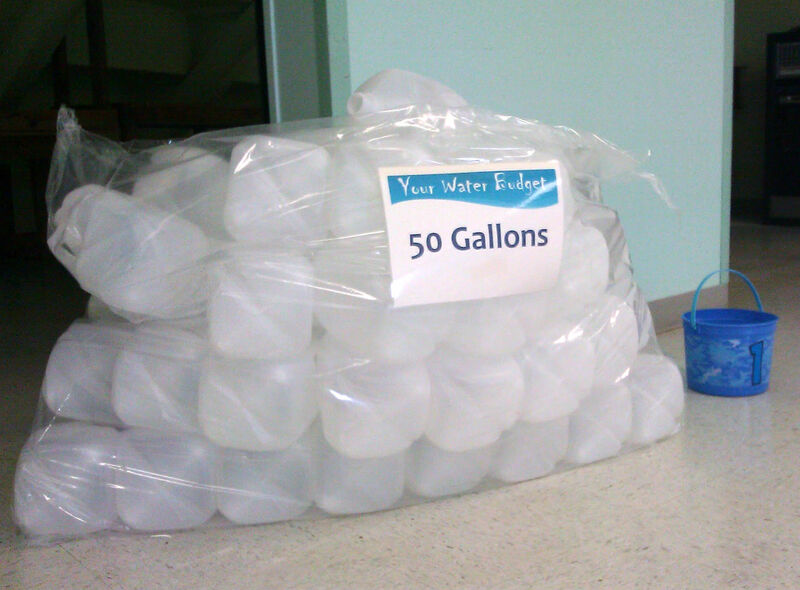 Water Budget made up of 50 gallon jugs. After playing this game, youth will recognize significant water use activities such as irrigation and bathing while learning the techniques they can use to reduce their impact on water. This game was developed in 2012 by Anne Yasalonis and Shannon Carnevale and has since has been played by approximately 6,000 fourth grader students. Several teachers have requested the game cards for use in their classrooms and felt the game helped their students’ understand the impact of wasting water. Data collected from post-evaluations indicate that participants gain a better understanding of water uses, the collective impact residential water uses can have on conservation goals, and increased knowledge about the limited water resources.